Infections from viruses or bacteria are the main cause of sore throats and can make it difficult to talk and breathe. Allergies and sinus infections can also contribute to a sore throat. If you have a sore throat that lasts more than five to seven days, you should see your doctor. While increasing your liquid intake, gargling with warm salt water, or taking over-the-counter pain relievers may help, if appropriate, your doctor may write you a prescription for an antibiotic. Sore throats often accompany viral infections, including the flu, colds, measles, chicken pox, whooping cough, and croup. One viral infection, infectious mononucleosis, or “mono,” takes much longer than a week to be cured. This virus lodges in the lymph system, causing massive enlargement of the tonsils, with white patches on their surface. Other symptoms include fever, chills, headache, and swollen glands in the neck, armpits, and groin. If you are suffering from mono, you will likely experience a sore throat that may last for one to four weeks and sometimes cause serious breathing difficulties. Mono causes extreme fatigue that can last six weeks or more, and it can also affect the liver, leading to jaundice, or yellow skin and eyes. Strep throat is an infection caused by a particular strain of streptococcus bacteria. This infection can also damage the heart valves (rheumatic fever) and kidneys (nephritis), cause scarlet fever, tonsillitis, pneumonia, sinusitis, and ear infections. Symptoms of strep throat often include fever, white draining patches on the throat, and swollen or tender glands in the neck. Children may have a headache and stomach pain. Tonsils and adenoids act as a defense against infections that invade the body through the nose and mouth. They are part of the lymphatic system of the body, a protective system whose cells attack and literally devour bacteria. They are very active during the early years of life. Since small children put dirty fingers, toys, and a variety of strange objects into their mouths and are exposed to germs from many sources, these built-in germ traps are very useful. Of course, tonsils and adenoids can’t possibly destroy every germ that enters the nose and throat, but they do serve as barriers against many bacteria. For this reason, they frequently get involved in infections such as colds and sore throats and may become overwhelmed by infection. Once they have become chronically infected, tonsils and adenoids may become a source of continuing or recurring infection instead of a protective device. Also, their usefulness decreases as a child grows older and develops immunity to many infections. A tonsillectomy – or operation to remove the tonsils – is likely to be performed only when the tonsils have become chronically infected and enlarged sufficiently to obstruct breathing. Removal of adenoids is performed only when diseased adenoids cause nose or ear complications and other methods of treatment fail to produce the desired results. Difficulty in swallowing (dysphagia) is common among all age groups, especially the elderly. This may be caused by many factors, most of which are temporary and not threatening. Difficulties swallowing rarely represent a more serious disease, such as a tumor or a progressive neurological disorder. When the difficulty does not clear up by itself in a short period of time, you should see an otolaryngologist – head and neck surgeon. A sensation of a foreign body or “lump” in the throat. Surgery is used to treat certain problems. If a narrowing exists in the throat or esophagus, the area may need to be stretched or dilated. If a muscle is too tight, it may need to be dilated or released surgically. This procedure is called myotomy and is performed by an otolaryngologist – head and neck surgeon. 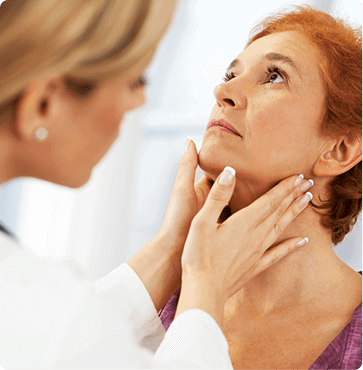 At Austin ENT Clinic, we provide care for these and other throat-related disorders. For prompt treatment, request an appointment online or call our office at 1-800-876-EARS (3277) to arrange a consultation with one of our board-certified ear, nose, and throat specialists. Want to know more about a specific ear, nose, or throat condition or treatment? Find it in our patient education library. Hear what patients of Austin ENT Clinic have to say about the quality of our service. © Austin ENT Clinic. All rights reserved. Austin Ear, Nose & Throat Clinic of Austin, Texas has ENT specialists in otolaryngology, audiology, and otology that treat a variety of disorders including hearing loss, tinnitus, vertigo, sinusitis, allergies, thyroid conditions, snoring, and more. Some specialties include balloon sinuplasty, balance therapy, snoreplasty, and pediatric ENT care.